Around an hour into the painful process that is putting the Dumptruck and Puddin' to bed, I did something that I never really thought I would do as a parent...I used Santa as a weapon. That's right, I used the "Santa is not going to bring you any presents if you don't stop being bad and go to sleep" threat. I'm not proud of it, but you know what? It flippin' worked. I can't believe it. They actually were more concerned about the opinion of a (spoiler alert) fictional obese pimp-suit wearing reverse cat burglar than there dear old dad!! After I got over the initial disappointment of realizing that my children value none of the things that I do for them nor the things that I buy for them, I started thinking—I am going to milk this Santa thing for everything it's worth for the next month! "Not going to put your own shoes on? I guess I am going to have to tell Santa that you are not listening to Daddy." "Don't want to eat your dinner? Well, Daddy has a call with Santa tonight and he's going to have to let Santa know that you are not doing what you are told to do!" "Did I just see you hit your sister? You know who else saw that? Santa saw that." (whispering in my most ominous voice) "He sees you when you're sleeping. He knows when you're awake. He's EVERYWHERE!!!" Description: Harold is a gorilla that was part of a children's birthday party animal show that was actually the cover for a cosmetic company's illegal animal testing group. At the shows, he was forced to walk about the party with a tray of cupcakes. After a horrible reaction to a new line of concealer, Harold had the ability to turn himself invisible. Using his new power, he tricked his captors and escaped from the facility. He now roams the streets seeking revenge upon any child that reminds him of the loud children that belittled him while he was forced to serve them cupcakes. Example of Proper Use: "You better be quite or the gorilla is going to eat all of our cupcakes... or even you! Description: Julie the Cruise Director Fairy is a very rare fairy. It is her job to watch over children and reward their good behavior with fun activities. She is sometimes accompanied by Gopher the Gnome and Isaac the Potion Master Imp. (Yes. I know that this a blatant rip-off of the Love Boat, but your kid's have no idea. Please feel free to use any other old tv show of your choosing. Maybe Alf—a fun loving alien that will eat your pets if your kids don't behave. Mork from Ork—an alien that will land and move into the attic to watch over you? Or how about The Facts of Life Trolls—they just get fat and yell at each other if your kids aren't good...well they would probably do that anyway. Potential Reward if Child Responds: A list of fun activities to do and related tickets, supplies, etc. show up on clipboard every Saturday morning. Example of Proper Use: "If you kids don't start acting better, then I guess Julie the Cruise Director Fairy isn't going to show up with something for us to do this weekend." Description: The Sleepy Time Seals are a rare breed of seals that can only sleep when your children are asleep. For every child that is born, a matching Sleepy Time Seal is born. This means that if your child is not sleeping, the Sleepy Time Seals are also not sleeping. Example of Proper Use: "Do you want your Sleepy Time Seal to die... huh? Why don't you love your Sleepy Time Seal? What did he or she ever do to you? If you don't go to bed soon, your Sleepy Time Seal probably won't make it through the day." So what do you think? Do you have any other imaginary discipline entities that I can use? Want to share your own? Let us know. 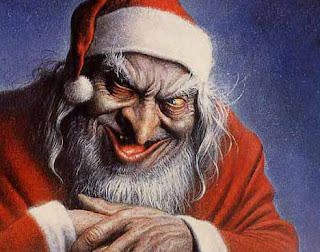 And remember, Santa is watching everything you do. So stop doing that in the shower in the mornings.